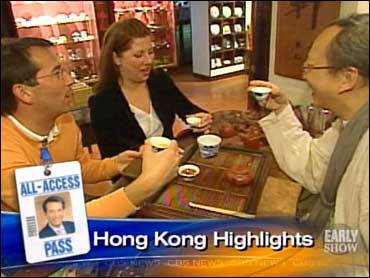 It was a long way from Long Beach, Calif., to Hong Kong for a weekend "All-Access" adventure. But Dave Price and trip recipient Kim Cooper would tell you that every mile they traveled was worth it. Price ventured from New York to Long Beach and the storied Queen Mary ocean liner, where he picked Cooper from nearby Westminster, Calif., to whisk her away for the whirlwind weekend. Then it was off on American Airlines to Tokyo, then Hong Kong, then back to Los Angeles. Dave continued on back to New York. His total for the trip: 19,432 miles. His running total, for the four weeks of the latest round of "All-Access" trips so far: 64,273 miles! he and Kim had in Hong Kong. Dave says it's "a city so deeply rooted in history, many ancient rituals are still vital parts of life" there. Such as the tea ceremony. Dave and Kim visited tea master Wing Chi Ip to learn about the proper way to prepare and drink tea. Next, Dave and Kim headed out to see some of the other ancient traditions the city has to offer, such as the markets that have been part of Hong Kong life for centuries. "You can find almost anything" on those streets, Dave said, "And I mean, anything!" Including freeze-dried gecko pops! They're supposed to be good for tummy woes but, Dave speculated, they'd probably GIVE him stomach problems! From Hong Kong's bustling downtown, Dave and Kim took a cable car to Lantau Island to see the world's largest bronze sitting Buddha! Once on the island, they had to climb 268 stairs to reach the statue. Warmed up from their hike, they were ready for more physical activity, and got it with a lesson from a master in the Chinese martial art of kung fu. Appetites firmly in stomach, Dave and Kim sampled a Hong Kong meal featuring noodles. Then, their "All-Access" pass got them the chance to watch master noodle chef Kim Ping making noodles from dough. They also tried their hands at it. Their trip concluded on a boat in Hong Kong Harbor. Dave and Kim stayed in luxury suites in the JW Marriott Hong Kong. The trip was arranged with the help of the Hong Kong Tourism Board. Tell us and if you can be in one of the cities Dave is visiting across the country on Fridays through March 23, you could be whisked away on an "All-Access" weekend, too. Join Dave in Pittsburgh on Friday, March 16. If you can't get to the cities Dave is heading for, you can win an amazing "All-Access Pass" weekend by playing at home. Each Wednesday through March 28, we'll ask a question about his past weekend's "All-Access" adventure. Every correct answer gives you a chance at the ultimate "All-Access" weekend — a trip for two to the Tony Awards, to be broadcast live on CBS on June 10, 2007. What martial art did Dave and Kim learn? Click here for details and to enter.